Grumman/Butkus Associates (G/BA) is a nationally recognized, professional consulting firm specializing in sustainable design engineering and energy efficiency consulting. We provide mechanical and electrical services to commercial, educational, governmental, healthcare, laboratory, hotel, and industrial clients, with particular expertise in energy-intensive facilities. 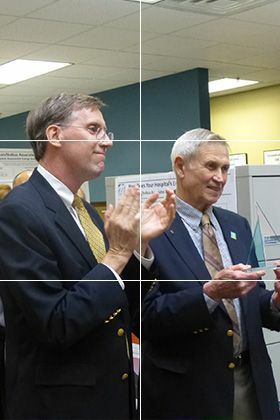 Dave Grumman founded the firm in May 1973, as Enercon, Ltd. As a one-person energy consulting firm, Enercon offered consulting services to help building owners and managers reduce the operating cost of their facilities through energy conservation—at a time when few were thinking about energy. In 1981, Enercon, Ltd. became Grumman/Butkus Associates with the promotion of Al Butkus to principal. That same year, G/BA opened an office in Wauwatosa, WI, headed by Jeff Conner. The establishment of the Wisconsin office initiated a geographic expansion that significantly contributed to the firm’s growth throughout the 1980s. Also during that period, G/BA expanded its focus by adding a wide range of specialized consulting services, as well as full mechanical, electrical, and plumbing design. In 2013, G/BA opened its New York regional office, specializing in commissioning and retro-commissioning services. A small Florida branch of the firm was formed in 2016. Today, G/BA numbers more than 100 full-time staff, and we're continuing to grow. Our employees' skills are diverse, but we're united by a personal commitment to the environment and a belief that the work we do plays a valuable role in preserving our planet’s finite resources, in addition to providing our clients with outstanding service, substantial energy and cost savings, and creative problem solving. Currently, a majority of the firm’s work involves MEP design, including infrastructure assessments and upgrades, building renovations, new construction, commissioning and retro-commissioning, and LEED consulting. Energy studies and related analytical work remain foundational and currently represent about 20% of our business.